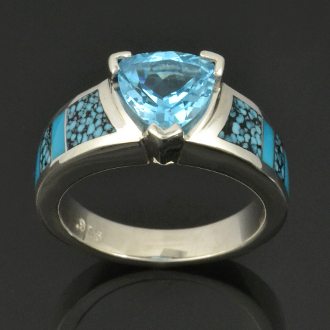 Blue topaz ring inlaid with spiderweb turquoise and turquoise. Sterling silver ring with alternating spiderweb turquoise and turquoise inlay with a blue topaz center. The Swiss blue 2.25 carat trillion cut topaz is accented by blue Kingman spiderweb turquoise with black matrix and robin egg blue turquoise inlay in this unique handmade ring. The sample ring (sold) shown is a size 6 1/4. The ring will be made to order in your ring size in 3 to 6 weeks. A matching man's wedding band and a matching woman's wedding band that goes next to the engagement ring is an option as well. This ring may be customized by changing the inlay stones or the center trillion stone. Contact us for a quote on any customization ideas.